Healing is a vibrant dance of life. Healing is awe inspiring, powerful, subversive and is continuously happening holistically throughout all aspects of the body (physically, emotionally, spiritually, and psychologically). 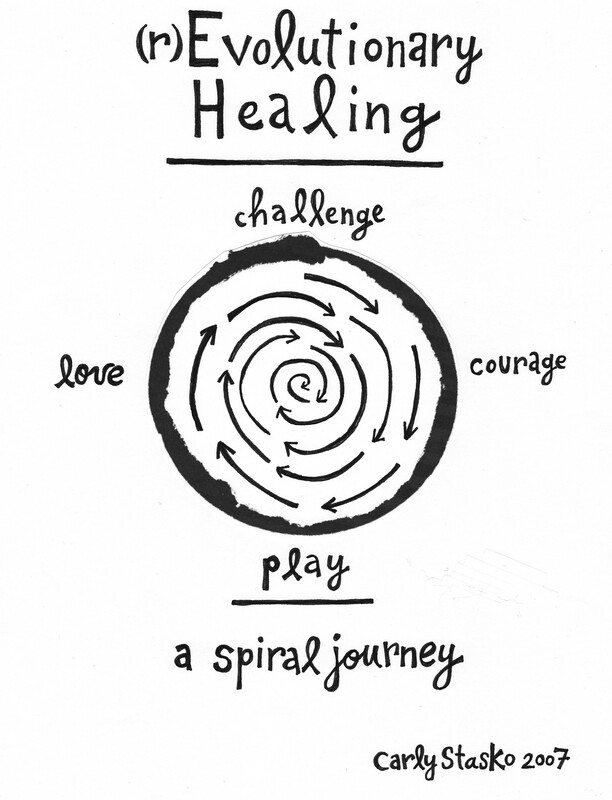 I’ve come to see creative healing and transformation as a process that can be envisioned as a spiraling wheel. The cycle begins with a challenge, something that has reached a crisis point and must be addressed. It could be an absence or silence in the mainstream narrative of history, education or media. It could be a social, economic or environmental injustice, an unsafe space, sadness, loss or a life-threatening illness. The next phase of this cycle requires individuals and communities to muster up their courage. It takes courage to believe that we can make a difference, or that creativity, which is so often disregarded as trivial, could provide new solutions for resisting and transforming what is challenging us. The third step isn’t always obvious – it is to play. Playfulness is ever present in all the various forms of creativity I have participated in such as zine publishing, performance art, education, and healing. The final step in the cycle is love, which takes the form of a new vision of the world and a new sense of purpose or place in that world. For example, this is demonstrated in culture jamming by increased media literacy and a stronger sense of belonging and participation in public space. This transformational process is what I call (r)Evolutionary Healing. With each revolution around the wheel, we pass through Challenge, Courage, Play and then Love. 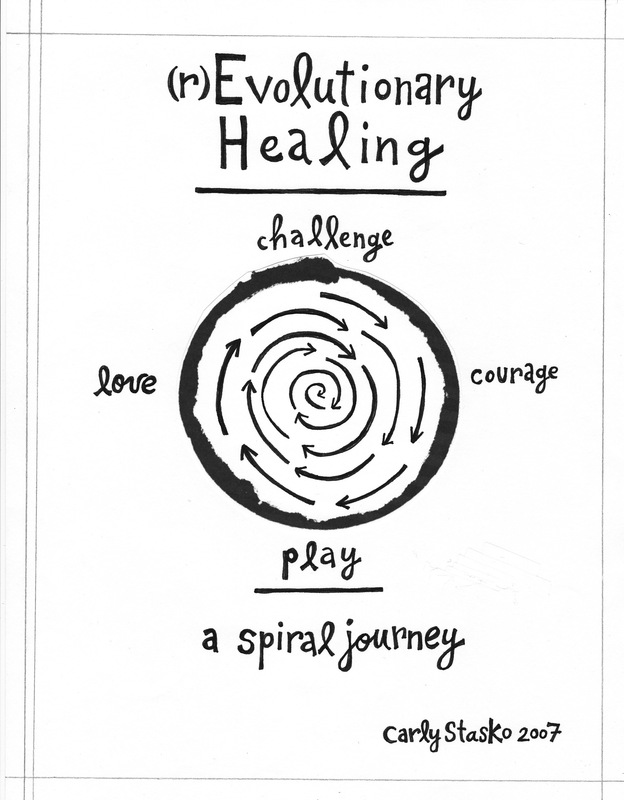 Rather than traveling in a straight line or repetitive cycle, this (r)Evolution is a spiral — a process through which each time around we have the potential to move closer to the central goal of wellness and interconnection. This model doesn’t limit us to the metaphor of a linear path; the occurrence of new challenges do not signal a failure, but instead indicates that there are still further opportunities to transform, lessons to learn, and connections to forge. Use link below to download the complete thesis including all artwork. This qualitative study uses narrative inquiry (Connelly & Clandinin, 1988, 1990, 2001) and self-study to investigate ways to further understand and facilitate the integration of holistic philosophies of education with media literacy pedagogies. As founder and director of the Youth Media Literacy Project and a self-titled Imagitator (one who agitates imagination), I have spent over 10 years teaching media literacy in various high schools, universities, and community centres across North America. This study will focus on my own personal practical knowledge (Connelly & Clandinin, 1982) as a culture jammer, educator and cancer survivor to illustrate my original vision of a ‘holistic media literacy pedagogy’. This research reflects on the emergence and impact of holistic media literacy in my personal and professional life and also draws from relevant interdisciplinary literature to challenge and synthesize current insights and theories of media literacy, holistic education and culture jamming. The early ideas for this thesis came to me when I discovered how helpful my creativity and media literacy skills were in the process of healing from cancer. At 27 I was diagnosed in Toronto’s Princess Margaret Hospital with Hodgkin’s Lymphoma, and suddenly felt the world crumble around me. I had come face to face with my mortality and I realized that life was not a promise but a gift. In what felt like a dream I began to reflect on my life, and certain common threads emerged: community, creativity and courage. I thought of the meaningful relationships in my life, the excitement and joy I have found through various creative projects, and the courage that had helped me reach out to loved ones, to follow my inspiration and to stand up for human rights through my work as an educator and activist. Though I had felt scared and powerless, a deep well of courage and a love of life bubbled up inside and gave me strength. I knew that there was more living, creating, and connecting to do, and that I would surrender to the unexpected journey ahead of me. That first night after the diagnoses I found myself humming a song, a slow and steady spiritual about hope, encouraging myself to carry on. There was no music in the hospital and I needed a soundtrack for the unexpected hero’s quest I had begun. I called my home number and sang the song into my answering machine. Later that night when I was feeling scared I called my machine and listened to myself singing about hope. Afterwards, I snuck into the medical supply room and gathered tape and scissors and began to make collages out of the magazines from the waiting room. There was an element of defiance to my creativity. I was going to surrender to the journey, yes, but I was going to do it my way. I was more than a medical reference number, statistic or diagnosis. I wanted to play an active part in creating the narrative of my healing. Just because there were parts of the story I had no control over didn’t mean that I couldn’t improvise and adapt. I didn’t realize it at the time, but I was creating independent media that could help me to make sense of the changes and serious challenges I was facing. At the same time that my identity and my life plans were thrown up in the air by a cancer diagnosis I had already begun to rebuild, to adapt and to create a new sense of self, purpose and possibility through skills I had acquired as a media literacy educator, artist and activist. I was first drawn to media literacy and education as a creative activist who played with the symbols and meanings of commercial media to create new narratives of empowerment and self-expression. From that I learned to analyze narratives and to have the courage to create new narratives that were meaningful to me and which affirmed my sense of self, interconnection and empowerment. Although I was declared cancer-free over two years ago now (and am very grateful for that), my healing process has carried on while studying as a graduate student. In recent years I have been regaining my strength and making sense out of the challenges I have faced and the lessons I have learned from facing them. The culmination of this thesis is more than an academic milestone for me, because throughout this process I have been able to find integration in my ideas as well as my identity. As this project draws to it’s culmination, I can sense the early beginnings of new and exciting life chapters that are yet to be written. In the final months of editing and clarifying my thesis, as the summer flowers bloomed outside my window and the trees in my neighborhood became heavy with delicious linden berries I felt a familiar quickening of my own creative spirit. On a conscious and intellectual level I understand that the writing of this thesis has been an important chapter in my journey of learning and healing, yet I could feel a wordless and embodied pull to create something for the senses. I wasn’t certain what exactly I was to create, but as I have learned to trust the creative instinct and be gentle with the subtle and often sensed cues that guide me towards authentic creative expression, I decided to make some room for play in each day. Even though I felt the pressure and extrinsic motivation of a deadline I knew that it was important to insist on some space for intrinsic motivation in my creative process. Everyday I practiced at least one form of creative exploration: I began a vegetable garden, I would invent new recipes in the kitchen guided by my taste buds and what was in season at the market or growing in my garden. I pulled out my box of coloured papers and torn-out pictures from magazines and began to collage. On a different day I dug out a box of broken necklaces and collected beads from my various travels and pieced together necklaces to give as gifts and rainbow catchers for my study window. I collected old furniture put out by neighbours and arranged in them in local bus shelters, providing unknown strangers with a comfortable place to sit and feel at home in public space. I dug through a basket of scrap fabric and began to sew bunting flags decorations for my autumn wedding out of colourful old saris I had found at the local Goodwill. A critical observer may have seen these acts as mere distraction or procrastination, but I knew that somehow by engaging with these creative projects I was contributing to the completion of my thesis. I wasn’t sure exactly how, but I trusted the creative process and allowed my creative expression to emerge. Now I can see how these creative experiments connect to key concepts discussed in the thesis, such as culture jamming, collage, narrative, and transformation. The ideas in this thesis are inspired by the process of culture jamming, a form of creative activism that plays with symbols and meaning to express subversive, critical, and hopeful counter-narratives within a predominantly corporate media landscape. I’ve come to describe the pedagogical process of meaning-making inspired by culture jamming as a ‘culture collage’. Each creative project I have engaged with during these final months has an element of culture collage — whether combining images from magazines or ingredients from my garden, bringing new life to broken necklaces and second-hand saris, or editing my thesis — I have been pulling different sources together to create new experiences, new artifacts and new narratives. The weaving together of different parts to create a new whole also connects with the theme of holistic education discussed in my thesis. The term ‘holistic’ refers to both the whole child and wholistic approach to education, as well as the ‘holi’ and spiritual component of transformative learning. The spiritual quality of this collage process resides in meaning that is created and the new sense of self and place in the world that is articulated through the integration of various parts. The culmination of this thesis corresponds with the culmination of my most ambitious summer art project: the sewing of a large multi-coloured quilt. After over a decade of gathering different fabric scraps from all over the world including China, Japan, Indonesia, Africa, Peru, France, The Coastal Salish Indigenous Nation, along with vintage fabrics passed down in my family and the families of friends, I had a large and colourful collection of textiles to work with. I had never sewed a quilt before, so I told myself it was just a different incarnation of a collage, something I’m quite familiar with by this point. Every day I would write, edit and sew. Sometimes I would layout the scraps of fabric, imagining different ways to combine them; other times I would play with the layout of this thesis, trying to imagine the best way to organize the different sections and chapters. Eventually I began to fuse the two processes in my dreams, where I would stitch together ideas, each paragraph taking on a different colour or pattern to connote it’s meaning, using a magical machine that looked like a hybrid between my sewing machine and laptop. I am glad that I trusted the process, because it has been a wonderful experience to feel the two projects fuse together and come to completion. 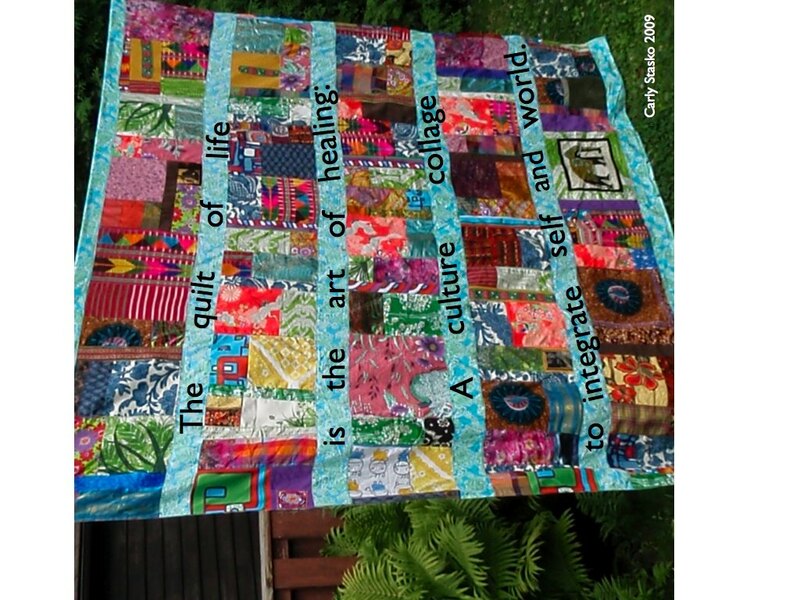 As I complete this thesis I wonder how I will use these ideas and pedagogical approaches in my future work as an educator and creator; and as I complete the quilt I wonder about the living I have ahead of me. After confronting my own mortality when I faced cancer, I experienced a form of post-traumatic growth. I am grateful everyday for the wild unfolding of this beautiful life, and I feel the vitality in my healthy body in every cell. The unanticipated embodied media literacy curriculum that I underwent as I healed from cancer has helped me tune in to the meaning in my body, my environment, and my daily life. Writing this thesis has been a personal, transformative and healing journey for me. The spark of inspiration for this work was first ignited during a very dark time in my life, and it illuminated a hopeful and meaningful path for me when I felt most lost. This path has led me back to my love of teaching, and to several critical ideas and creative processes that have always shaped my work and inquiry. Yet the journey has made these familiar interests and endeavors new to me. The transformative process of learning and healing has helped me to make and experience new connections between pedagogy, healing and creative resistance. I have become emboldened with a courageous vulnerability to follow my creative intuition and articulate a new vision of myself as an artist, teacher and healer — as well as a new holistic approach to the field of media literacy education. 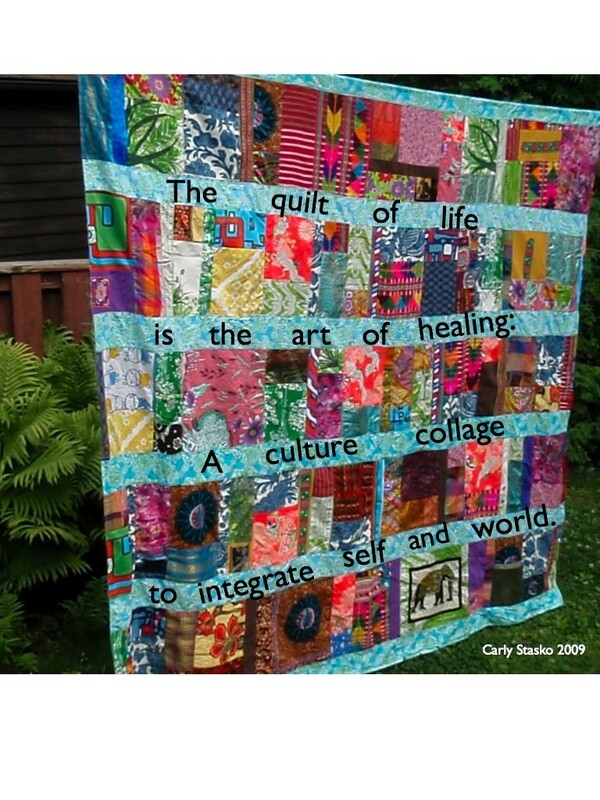 Much like my quilt, I feel like I have been slowly piecing myself back together in the past few years. I have not recreated ‘the old pre-cancer’ person I used to be. Instead I have created something new: I have discovered and reconnected with who I am now as a result of — and benefiting from — the various curves in the road of my healing and learning journey. Through the process of connecting the scattered and shattered parts of myself I have learned to see media literacy in a new light. In this thesis I hope to explore this new vision of a pedagogy of holistic media literacy education in the face of uncertain futures, accelerated change and the increasing influence of media in our daily lives — a pedagogy of play, transformation, courageous vulnerability, and hope.